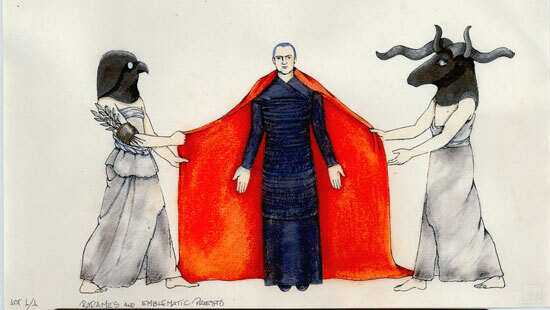 The UC Libraries Digital Collection Project won a Sautter Award for enabling UC Libraries to make publicly accessible its digital assets like this drawing by UC Merced professor Dunya Ramicova, who designs costumes for theater, film and TV. Ten teams across the University of California won the 2016 Larry L. Sautter Award for using information technology to make university operations more effective and efficient and to better serve faculty, staff, students and patients. Systemwide Chief Information Officer Tom Andriola announced the winners today (July 12, 2016) at the UC Computing Services Conference in Santa Cruz. UC Libraries Digital Collection Project (UC Office of the President) enables all UC Libraries to efficiently and cost-effectively create, manage, and make accessible to the public hundreds of thousands of digital assets, ranging from historical records and maps to photographs and films, on a public website called Calisphere. Services include a shared digital asset management system that any campus library may use, a tool to aggregate and index digital content across collections, and an engaging interface that allows the public to discover UC’s archival treasures. Open Proposals: Crowdsourcing Innovation at an Academic Institution (UCSF) is a platform that encourages innovation by allowing researchers, administrators, students, and other academic community members to share and discuss proposals and projects through an open, online forum before submitting them for final review. UC TrialQuest: Sharing Clinical Trial Data across UC (UC Davis, UC Irvine, UCLA, UC San Diego, UCSF) is a tool that enables staff to efficiently search for and identify, in real time, open or pending clinical trials across the five UC Health campuses. The search tool has reduced redundant effort for common research administration processes, saving UC significant resources as a result. Inclusive Access (UC Davis) converts books into digital content that students can easily access on the first day of class. This model encourages higher sales volume, which is leveraged to reduce prices. Inclusive Access promotes the use of digital adaptive technology, meaning the digital materials can adapt to a student’s learning style and pace and offer immediate feedback to help increase student engagement and learning. Secure Compute Research Environment (UC Santa Barbara) is a private, secure virtual environment in which researchers can remotely analyze sensitive data, create research results, and produce their results and analysis. Researchers can access this tool from any Internet-connected device, including most mobile devices. The Wisdom Café (UC Berkeley) is a website that promotes a social model for staff development, enabling employees to take greater charge of their own learning. The platform offers content curated by learning professionals, as well as tips, tools, best practices, recommendations, and ideas contributed by the staff community. Career Tracks (UC Riverside) is an online web application for Career Tracks, UC’s system-wide classification structure for non-represented staff positions. UC Riverside’s system supports the new Career Tracks job descriptions and provides a Job Builder tool, allowing campus departments to create and manage job descriptions. Courtyard Study Lounge Scheduling Automation (UC Irvine) is a program that allows students to book study space in the Student Center anytime and anywhere they have access to the Internet. Low-cost Server Hosting (UC Santa Cruz) is a service designed to bridge the gaps in cloud hosting and virtualization and offer only the best of both worlds. The service is free, offers regular security scans, enables customers to manage their virtual servers, and even provides students a safe and inexpensive place to try out innovative ideas. GLAAS – Graduate Lecturer Academic Appointment System (UC Merced) brings automation and standardization to assigning and appointing lecturers, teaching assistants, teaching fellows, readers and graduate student researchers. The system offers standardized templates, promotes paperless communication and can be used by all UC Merced schools. To learn more about the Sautter Award and the 2016 recipients, visit the program website.